With just over two months until its release, Rockstar Games has released a brand new trailer for Red Dead Redemption 2, and it focuses solely on gameplay. Clocking in at just over six minutes, the trailer provides tons of information on what players can expect to encounter in October when the highly-anticipated prequel launches. Not only that, but the trailer is actually our first look at the gameplay, and was put together using only in-game footage. A few story beats can be found as well, but mostly the trailer tackles the environment and some game mechanics. With that said, let’s take a closer look at Red Dead Redemption 2’s newest video. As we’ve known for a while now, Red Dead Redemption 2 puts players in the shoes of Arthur Morgan, a member of the gang run by Dutch van der Linde (an antagonist from Red Dead Redemption and the gang John Marston was a part of before that game took place) at the height of their infamy. Set in 1899, Dutch’s Gang is currently on the run from lawmen attempting to wipe the outlaw way of life out of the West, so the gang is constantly moving and setting up camp in new locations. As such, the gang is a big family, and the only family Arthur has ever known. Chores, tasks, and even games can be found at the gang’s camp, and these activities will benefit the player and the gang itself in yet unknown ways. Fishing and Texas Hold ‘em were shown, and more missions and things to do can be opened up by speaking to members of the camp. Arthur doesn’t have to participate in these tasks, but again, doing so will be beneficial. Also of note, during this part of the trailer, there is a shot of some gang members sitting around a campfire. At that fire, we see Red Dead Redemption’s main protagonist, John Marston – and he’s not alone; John is joined by his wife, Abigail, and their son, James. We knew since RDR2’s third trailer that Marston would be in the game in some way, but now we have confirmation that his family will be as well. What role the three characters will play is yet to be determined, but it’s nice to see the timeline of events lining up properly. Horses have received a major overhaul in this sequel. In Red Dead Redemption, horses had basic stats; some were faster than others, some had better stamina, etc. Taking that one step further, Red Dead Redemption 2 features different breeds that are better for certain tasks. We see horses racing, pulling carriages, hauling a wagon loaded with lumber, and of course, the standard transportation-focused horse. 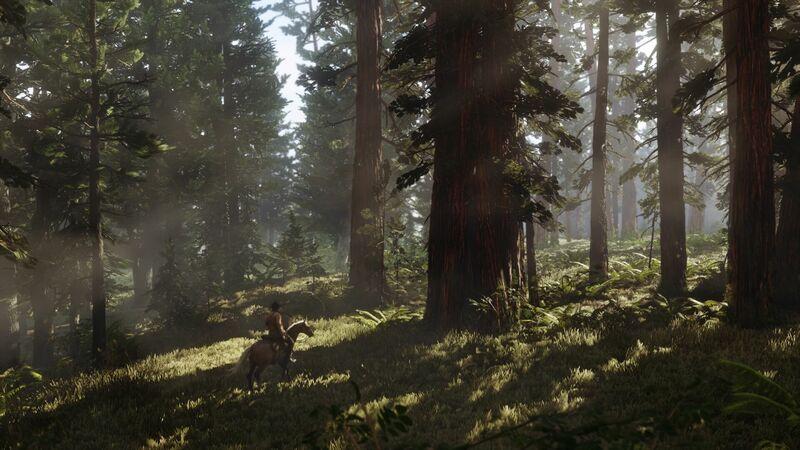 The bit about hauling lumber makes me wonder if there will be side missions where horses, and possibly gang members, must be sent out to gather supplies. Sending out the proper type of horse could yield greater rewards, similar to No Man’s Sky’s frigate mission system. Aside from wondering about that, Arthur’s bond with his horses will also play a role. Players can calm the horses when they are anxious, brush their manes, and feed them in order to strengthen that bond; in return, the horse will perform better. Also, it’s stressed that Arthur will use his horse’s saddlebags for transportation and carrying inventory, such as animal carcasses, supplies, and weapons. Also stressed in the trailer is the fact that “guns aren’t the only way to interact with the environment.” More than a few moments zero in on melee combat. As in Red Dead Redemption, fist fighting will be prominent, but it seems to a much higher degree this time around. 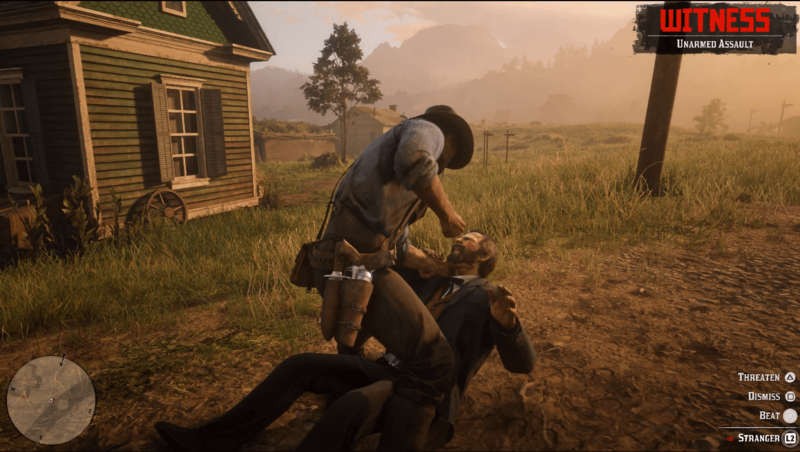 Arthur Morgan is an enforcer for Dutch’s Gang, so it only makes sense that he must handle some situations with his fists instead of a rifle or revolver. Tackling, grappling, and choke holds are shown as options in these instances. I’m sure you could technically still just kill these NPCs, but that will most likely end in negative repercussions, or perhaps even failing the missions tied to the encounters. Aside from fighting, Arthur can interact with people in the game world more extensively than in the previous game. We witness Morgan greet a fellow passerby while riding his horse with the press of a button. Will interactions like this result in anything more than just an optional line of dialogue? I sure hope so. Besides greeting, NPCs can also be antagonized, if wreaking havoc is your type of thing (as is most people’s in Rockstar video games). If the NPC is a member of law enforcement, the choices change a bit; players can either defuse a situation or escalate it, with both being viable options for most missions, according to the narrator of the trailer. Some situations may require more tense decisions being made. At one point a man is hanging from the side of a cliff by his hands, and it is clear players are faced with the option to save him or let him fall. Players can take the honorable approach in moments like these (which will affect the now-confirmed return of an in-game honor system), but just how far the repercussions of these meetings will extend is currently unknown. As was expected, Red Dead Redemption 2 also looks absolutely stunning. From fog and lighting effects, to players becoming dirty while rolling around in the dirt; from horse models to facial and movement animations, it is clear to see Rockstar has put much time and care into developing this game, learning much from its predecessor and the insanely-successful Grand Theft Auto V. On more than one occasion, the trailer showcases sprawling and beautiful prairies, mountain ranges, and dense forests. I’m sure folks will be hard pressed to find a better-looking game than RDR2 when it is being played in 4K on either the PS4 Pro or Xbox One X. Personally, Red Dead Redemption is one of my top five favorite games of all time, so my expectations are naturally through the roof. It is the only Rockstar game I finished to 100% completion multiple times, along with its Undead Nightmare expansion. With that said, I was blown away by this look at the gameplay. This prequel seeks to take everything I loved from the first game and turn the dial up to 11. Rockstar also promises more gameplay videos will be coming, with the next focusing on missions and gangs, and it’s hard to imagine there not being a video sooner or later showcasing Red Dead Redemption 2’s online component. With as much a success as Grand Theft Auto Online was – and still is five years after release – I’m positive Red Dead’s equivalent will be something at which to marvel. Rockstar Games’ Red Dead Redemption 2 releases October 26 for PlayStation 4 and Xbox One. For more on Red Dead Redemption 2, including thoughts on future gameplay teases, and the official review upon release, keep your browser locked to Geeks + Gamers.